For various examples of cuisine, see List of German dishes. The cuisine of Germany has evolved as a national cuisine through centuries of social and political change with variations from region to region. Some regions of Germany, like Bavaria and neighbouring Swabia, share dishes with Austrian and parts of Swiss cuisine. The Michelin Guide of 2015 awarded 11 restaurants in Germany three stars, the highest designation, while 38 more received two stars and 233 one star. German restaurants have become the world's second-most decorated after France. The average annual meat consumption is 59.7 kg (132 lb) per person. The most common varieties are pork, poultry and beef. Other varieties of meat are widely available, but do not play an important role. Meat is usually braised; fried dishes also exist, but these recipes usually originate from France and Austria. Several cooking methods used to soften tough cuts have evolved into national specialties, including Sauerbraten (sour roast), involving marinating beef, horse meat or venison in a vinegar or wine vinegar mixture over several days. A long tradition of sausage-making exists in Germany; more than 1,500 different types of sausage (German: Wurst) are made. Most Wurst is made with natural casings of pork, sheep or lamb intestines. 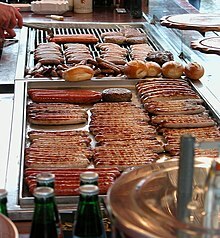 Among the most popular and most common are Bratwurst, usually made of ground pork and spices, the Wiener (Viennese), which may be pork or beef and is smoked and fully cooked in a water bath, and Blutwurst (blood sausage) or Schwarzwurst (black sausage) made from blood (often of pigs or geese). Thousands of types of cold cuts also are available which are also called "Wurst" in German. 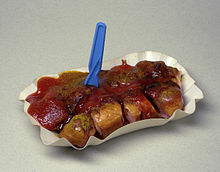 There are many regional specialties, such as the Münchner Weißwurst (Munich white sausage) popular in Bavaria or the Currywurst (depending on region, either a steamed pork sausage or a version of the Bratwurst, sliced and spiced with curry ketchup) popular in the metropolitan areas of Berlin, Hamburg and the Ruhr Area. Strict regulations governing what may and may not be put into them have been in force in Germany since the 13th century. In the market ordinance of Landshut in 1236, it was set down that only top-quality meat could be made into sausages. Of salt water fish, Alaska pollock is the most common. Popular freshwater fish on the German menu are trout, pike, carp, and European perch also are listed frequently. Seafood traditionally was restricted to the northern coastal areas, except for pickled herring, which often served in a Fischbrötchen, as Rollmops (a pickled herring fillet rolled into a cylindrical shape around a piece of pickled gherkin or onion), or Brathering (fried, marinated herring). Today, many sea fish, such as fresh herring, tuna, mackerel, salmon and sardines, are well established throughout the country. Prior to the industrial revolution and the ensuing pollution of the rivers, salmon were common in the rivers Rhine, Elbe, and Oder and only slowly started to return along with a growing consciousness for environmental questions and resulting measures, such as state-of-the-art sewage plants, reduction of agricultural deposits, et cetera. Fish fingers, known as Fischstäbchen (lit. : "fish sticklets"), are a popular processed food made using a whitefish, such as cod, haddock or pollock, which has been battered or breaded. Vegetables are often used in stews or vegetable soups, but are also served as side dishes. Carrots, cauliflower, turnips, spinach, peas, beans, broccoli and many types of cabbage are very common. Fried onions are a common addition to many meat dishes throughout the country. Circa 1900, carrots were sometimes roasted in water, with the broth used in place of coffee. Asparagus is a popular seasonal side or main dish with a yearly per-capita consumption of 1.5 kg (3.3 lb). The white variety is especially popular in Germany and more common than green asparagus. Restaurants will sometimes devote an entire menu to nothing but white asparagus when it is in season. 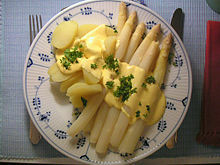 Spargel season (German: Spargelzeit or Spargelsaison) traditionally begins in mid-April and ends on St. John's Day (24 June). Breakfast (Frühstück) commonly consists of bread, toast, or bread rolls with butter or margarine, cold cuts, cheeses, jam (Konfitüre or more commonly called Marmelade), honey and eggs (typically boiled). Common drinks at breakfast are coffee, tea, milk, cocoa (hot or cold) or fruit juices. 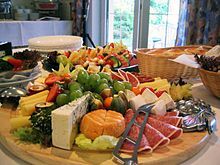 It is very common to eat hearty toppings at breakfast, including deli meats like ham, salted meats, salami and meat-based spreads such as Leberwurst (liver sausage),Teewurst or Mettwurst and cheeses such as Gouda, Frischkäse (cream cheese), Brie, Harzer Roller, Bergkäse and more. Most bakeries tend to sell belegte Brötchen (sandwiches from bread rolls), especially in the morning, for people on the go. Traditionally, the main meal of the day has been lunch (Mittagessen), eaten around noon. Dinner (Abendessen or Abendbrot) was always a smaller meal, often consisting only of a variety of breads, meat or sausages, cheese and some kind of vegetables, similar to breakfast, or possibly sandwiches. Smaller meals added during the day bear names such as Vesper (in the south), Brotzeit (bread time, also in the south), Kaffee und Kuchen ( listen (help·info), literally for ″coffee and cake″), or Kaffeetrinken. It is a very German custom and comparable with the English Five-o'clock-Tea. It takes time between lunch and dinner, often on Sundays with the entire family. However, in Germany, as in other parts of Europe, dining habits have changed over the last 50 years. Today, many people eat only a small meal in the middle of the day at work, often also a second breakfast, and enjoy a hot dinner in the evening at home with the whole family. For others, the traditional way of eating is still rather common, not only in rural areas. Breakfast is still very popular and may be elaborate and extended on weekends, with friends invited as guests; the same holds for coffee and cake. Since the 1990s, the Sunday brunch has also become common, especially in city cafés. Noodles, made from wheat flour and egg, are usually thicker than the Italian flat pasta. Especially in the southwestern part of the country, the predominant variety of noodles are Spätzle, made with a large number of eggs, and Maultaschen, traditional stuffed noodles reminiscent of ravioli. Besides noodles, potatoes are common. Potatoes entered the German cuisine in the late 17th century, and were almost ubiquitous in the 19th century and since. They most often are boiled (in salt water, Salzkartoffeln), but mashed (Kartoffelpüree or Kartoffelbrei) and pan-roasted potatoes (Bratkartoffeln) also are traditional. French fries, called Pommes frites, Pommes (spoken as "Pom fritz" or, respectively, "Pommes", deviating from the French pronunciation which would be "Pom freet" or "Pom") or regionally as Fritten in German, are a common style of fried potatoes; they are traditionally offered with either ketchup or mayonnaise, or, as Pommes rot/weiß (lit. fries red/white), with both. Also common are dumplings (including Klöße as the term in the north or Knödel as the term in the south) and in southern Germany potato noodles, including Schupfnudeln, which are similar to Italian gnocchi. Salads, also modern variations, as well as vegetarian dishes become more and more popular in Germany. With the exception of mustard for sausages, German dishes are rarely hot and spicy; the most popular herbs are traditionally parsley, thyme, laurel, chives, black pepper (used in small amounts), juniper berries, nutmeg, and caraway. Cardamom, anise seed, and cinnamon are often used in sweet cakes or beverages associated with Christmas time, and sometimes in the preparation of sausages, but are otherwise rare in German meals. Other herbs and spices, such as basil, sage, oregano, and hot chili peppers, have become popular since the early 1980s. Fresh dill is very common in a green salad or fish fillet. Mustard (Senf) is a very common accompaniment to sausages and can vary in strength, the most common version being Mittelscharf (medium hot), which is somewhere between traditional English and French mustards in strength. Düsseldorf, similar to French's Deli Mustard with a taste that is very different from Dijon, and the surrounding area are known for its particularly spicy mustard, which is used both as a table condiment and in local dishes such as Senfrostbraten (pot roast with mustard). In the southern parts of the country, a sweet variety of mustard is made which is almost exclusively served with the Bavarian speciality Weißwurst. German mustard is usually considerably less acidic than American varieties. Garlic has never played a large role in traditional German cuisine, as it was long frowned upon for causing bad breath, but has risen in popularity in recent decades due to the influence of French, Italian, Spanish, Portuguese, Greek, and Turkish cuisines. Ramson, a rediscovered herb from earlier centuries, has become quite popular again since the 1990s. A wide variety of cakes, tarts and pastries are served throughout the country, most commonly made with fresh fruit. Apples, plums, strawberries, and cherries are used regularly in cakes. Cheesecake is also very popular, often made with quark. Schwarzwälder Kirschtorte (Black Forest cake, made with cherries) is probably the most well-known example of a wide variety of typically German tortes filled with whipped or butter cream. German doughnuts (which have no hole) are usually balls of yeast dough with jam or other fillings, and are known as Berliner, Pfannkuchen (in Berlin and Eastern Germany), Kreppel or Krapfen, depending on the region. Eierkuchen or Pfannkuchen are large (usually around 20–24 cm in diameter), and relatively thin (~5mm) pancakes, comparable to the French crêpes. They are served covered with sugar, jam or syrup. Salty variants with cheese, ground meat or bacon exist as well as variants with apple slices baked in (called Apfelpfannkuchen, literally for apple pancakes), but they are usually considered to be main dishes rather than desserts. In some regions, Eierkuchen are filled and then wrapped; in others, they are cut into small pieces and arranged in a heap (called Kaiserschmarrn, often including raisins baked in). The word Pfannkuchen means pancake in most parts of Germany. A popular dessert in northern Germany is Rote Grütze, red fruit pudding, which is made with black and red currants, raspberries and sometimes strawberries or cherries cooked in juice with corn starch as a thickener. It is traditionally served with cream, but also is served with vanilla sauce, milk or whipped cream. Rhabarbergrütze (rhubarb pudding) and Grüne Grütze (gooseberry fruit pudding) are variations of the Rote Grütze. A similar dish, Obstkaltschale, may also be found all around Germany. Ice cream and sorbets are also very popular. Italian-run ice cream parlours were the first large wave of foreign-run eateries in Germany, which began around the mid 1850s, becoming widespread in the 1920s. Spaghettieis, which resembles spaghetti, tomato sauce, and ground cheese on a plate, is a popular ice cream dessert. A very common dish in Christian German culture is Würstchen mit Kartoffelsalat, sausage (mostly Wiener Würstchen) with potato salad, which usually is served on Christmas Eve. In recent years, raclette became known as a Christmas dish, too. While originating in Switzerland the dish has been adapted in wide regions of Germany. On the Christmas Days following Christmas Eve, roasted goose is a staple Christmas Day meals. It is sometimes replaced with European carp, particularly in Southern areas. The carp is cut into pieces, coated in breadcrumbs and fried in fat. Common side dishes are potato salad, cucumber salad or potatoes. Bread (Brot) is a significant part of German cuisine, with the largest bread diversity in the world. Around 200 types of breads and 1,200 different types of pastries and rolls are produced in about 17,000 bakeries and another 10,000 in-shop bakeries. Bread is served usually for breakfast (often replaced by bread rolls) and in the evening as (open) sandwiches, but rarely as a side dish for the main meal (popular, for example, with Eintopf or soup). The importance of bread in German cuisine is also illustrated by words such as Abendbrot (meaning supper, literally evening bread) and Brotzeit (snack, literally bread time). In fact, one of the major complaints of the German expatriates in many parts of the world is their inability to find acceptable local breads. Regarding bread, German cuisine is more varied than that of either Eastern or Western Europe. Bread types range from white wheat bread (Weißbrot) to grey (Graubrot) to black (Schwarzbrot), actually dark brown rye bread. Some breads contain both wheat and rye flour (hence Mischbrot, mixed bread), and often also wholemeal and whole seeds such as linseed, sunflower seed, or pumpkin seed (Vollkornbrot). Darker, rye-dominated breads, such as Vollkornbrot or Schwarzbrot, are typical of German cuisine. 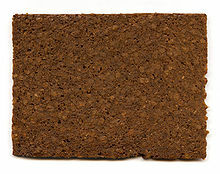 Pumpernickel, sweet-tasting bread created by long-time-steaming instead of regular baking, is internationally well known, although not representative of German black bread as a whole. Most German breads are made with sourdough. Whole grain is also preferred for high fiber. Germans use almost all available types of grain for their breads: wheat, rye, barley, spelt, oats, millet, corn and rice. Some breads are even made with potato starch flour. Germany's most popular breads are rye-wheat (Roggenmischbrot), toast bread (Toastbrot), whole-grain (Vollkornbrot), wheat-rye (Weizenmischbrot), white bread (Weißbrot), multigrain, usually wheat-rye-oats with sesame or linseed (Mehrkornbrot), rye (Roggenbrot), sunflower seeds in dark rye bread (Sonnenblumenkernbrot), pumpkin seeds in dark rye bread (Kürbiskernbrot) and roasted onions in light wheat-rye bread (Zwiebelbrot). Bread rolls, known in Germany as Brötchen, which is a diminutive of Brot, with regional linguistic varieties being Semmel (in South Germany), Schrippe (especially in Berlin), Rundstück (in the North and Hamburg) or Wecken, Weck, Weckle, Weckli and Weckla (in Baden-Württemberg, Switzerland, parts of Southern Hesse and northern Bavaria), are common in German cuisine. A typical serving is a roll cut in half, and spread with butter or margarine. Cheese, honey, jam, Nutella, cold cuts such as ham, fish, or preserves are then placed between the two halves, or on each half separately, known as a belegtes Brötchen. Rolls are also used for snacks, or as a hotdog-style roll for Bratwurst, Brätel, Fleischkäse or Schwenker/Schwenkbraten. Franzbrötchen, which originated in the area of Hamburg, is the small, sweet pastry roll baked with butter and cinnamon. Beer is very common throughout all parts of Germany, with many local and regional breweries producing a wide variety of beers. The pale lager pilsener, a style developed in the mid-19th century, is predominant in most parts of the country today, whereas wheat beer (Weißbier/Weizen) and other types of lager are common, especially in Bavaria. A number of regions have local specialties, many of which, like Weißbier, are more traditionally brewed ales. Among these are Altbier, a dark beer available around Düsseldorf and the lower Rhine, Kölsch, a similar style, but light in color, in the Cologne area, and the low-alcohol Berliner Weiße, a sour beer made in Berlin that is often mixed with raspberry or woodruff syrup. Since the reunification of 1990, Schwarzbier, which was common in East Germany, but could hardly be found in West Germany, has become increasingly popular in Germany as a whole. Beer may also be mixed with other beverages such as pils or lager and carbonated lemonade: Radler (lit: cyclist), Alsterwasser (lit: water from the river Alster). Since a beer tax law was changed in 1993, many breweries served this trend of mixing beer with other drinks by selling bottles of pre-mixed beverages. Examples are Bibob (by Köstritzer), Veltins V+, Mixery (by Karlsberg), Dimix (by Diebels) and Cab (by Krombacher). Wine is also popular throughout the country. German wine comes predominantly from the areas along the upper and middle Rhine and its tributaries. Riesling and Silvaner are among the best-known varieties of white wine, while Spätburgunder and Dornfelder are important German red wines. The sweet German wines sold in English-speaking countries seem mostly to cater to the foreign market, as they are rare in Germany. Korn, a German spirit made from malt (wheat, rye or barley), is consumed predominantly in the middle and northern parts of Germany. Obstler, on the other hand, distilled from apples and pears (Obstler), plums, cherries (Kirschwasser), or mirabelle plums, is preferred in the southern parts. The term Schnaps refers to both kinds of hard liquors. All cold drinks in bars and restaurants are sold in glasses with a calibration mark (Eichstrich) that is frequently checked by the Eichamt (~ Bureau of Weights and Measures) to ensure the guest is getting as much as is offered in the menu. Coffee is also very common, not only for breakfast, but also accompanying a piece of cake (Kaffee und Kuchen) in the afternoon, usually on Sundays or special occasions and birthdays. It is generally filter coffee, which is weaker than espresso. Coffeeshops are also very common in Germany. Tea is more common in the northwest. East Frisians traditionally have their tea with cream and rock candy (Kluntje). Germany has the tenth highest per capita coffee consumption worldwide. Popular soft drinks include Schorle, juice or wine mixed with sparkling mineral water, with Apfelschorle being popular all over Germany, and Spezi, made with cola and an orange-flavored drink such as Fanta. Germans are unique among their neighbors in preferring bottled, carbonated mineral water, either plain (Sprudel) or flavored (usually lemon) to noncarbonated ones. Drinking water of excellent quality is available everywhere and at any time in Germany. Water provided by the public water utilities can be had without hesitation directly from the tap. Usually, no chlorine is added. Drinking water is controlled by state authority to ensure it is potable. Regulations are even stricter than those for bottled water (see Trinkwasserverordnung). German regional cuisine can be divided into many varieties such as Bavarian cuisine (southern Germany) or Thuringian (central Germany) and Lower Saxon cuisine. Due to the physiogeographically situation, the Upper Rhine Plain with Germany's warmest climate, fruitful volcanic soils, already in the Roman period used medicinal springs and spas with very good infrastructural features, the proximity to France and Switzerland Baden had better prerequisites to develop a high quality gastronomy than Württemberg or Bavaria. Special plant crops such as tobacco, wine, fruit and horticulture are of supranational importance and offer the inhabitants and visitors a diverse and wide selection of local products. Asparagus and chestnuts are as skillfully used in the kitchen as tripe and escargot and a variety of fruity desserts and pastries is provided for the traditional German "Kaffee und Kuchen" (lit. "coffee and cake", similar to the British tea time). Nationwide this region features the highest density of star-rated restaurants, similar to the neighbouring region Alsace which does the same for France. The Bavarian dukes, especially the Wittelsbach family, developed Bavarian cuisine and refined it to be presentable to the royal court. This cuisine has belonged to wealthy households, especially in cities, since the 19th century. 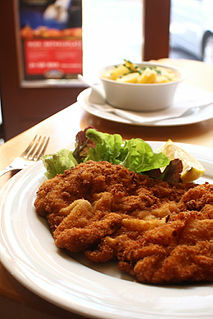 The (old) Bavarian cuisine is closely connected to Czech cuisine and Austrian cuisine (especially from Tyrol and Salzburg), mainly through the Wittelsbach and Habsburg families. Already in the beginning, Bavarians were closely connected to their neighbours in Austria through linguistic, cultural and political similarities, which also reflected on the cuisine. A characteristic Bavarian cuisine was further developed by both groups, with a distinct similarity to Franconian and Swabian cuisine. A Bavarian speciality is the Brotzeit, a savoury snack, which would originally be eaten between breakfast and lunch. Bavaria is a part of Southeastern Germany, including the city of Munich and spreading to board with the countries Austria and the Czech Republic. The region is located at higher elevations, and is known for yielding beet and potato crops and also for the production of fine beers. Due to its century-old history as a harbour town, the traditional cuisine of Hamburg is very diversified and sapid as ingredients’ supply was safe. Until the 20th century, it was predominantly characterized by the extensive choice of different kinds of fish from the river Elbe and the quick access to both the North Sea and the Baltic Sea, both being roughly 100 kilometers away from the city center. The neighboring regions did supply the city state with fresh vegetables, fruit came mainly from a region called Altes Land just southwest of Hamburg and until industrialization, the neighbourhood of Wilhelmsburg was considered the ‘milk isle’ of Hamburg. International trade made spices and exotic nutrition items from Asia and South America available since the 16th century which were soon incorporated into civic kitchens. On this basis, the cuisine of Hamburg developed its characteristics nowadays due to the supraregional harmonization of the Northern German and Scandinavian cuisine. Due to its high economic importance, Hamburg does feature many internationally recognized gourmet restaurants: 11 of them were awarded with a Michelin star in 2010. Typical for Hesse are Frankfurter Rippchen, a spiked pork cutlet, which is often served with sauerkraut and mashed potatoes. Also from Hessen comes the Frankfurt green sauce ("Grüne Sauce"). It is a cold sauce based on sour cream with the local herbs borage, chervil, cress, parsley, pimpinelle, sorrel and chives. The start of the season is traditionally Maundy Thursday ("Gründonnerstag"; which means "green Thursday" in German). Green sauce is mostly served with potatoes and boiled eggs. One of the best-known specialties from Hesse is the Frankfurter Kranz, a buttercream cake whose shape is reminiscent of a crown; a reminiscence of Frankfurt as the historical coronation city of the German emperors. Cider ( "Apfelwein" in German, or "Äppelwoi" in the Hessian dialect) is also very popular in and around Frankfurt. In the historic district Sachsenhausen there is the so-called Cider Quarter ("Äppelwoiviertel"), where there are numerous taverns that offer cider, especially in the summer months. In the cider taverns, "Handkäs mit Musik" is offered as a snack, a sour milk cheese served in a marinade of onions, vinegar and spices. Wheat, grapes, sugarbeets, and barley grow well, along with a variety of vegetables, which grow near Erfurt, the state's capital. Cauliflower [740 acres (3.0 km2)], cabbage (savoy, red, white) [25 acres (100,000 m2)], kohlrabi [37 acres (150,000 m2)], and broccoli [37 acres (150,000 m2)] grow by traditional means near Erfurt. Tomatoes, lettuce, broad beans, onions, and cucumbers are grown in the eastern portion of the region near Jena under glass centers on about 12 acres (49,000 m2) of land. Thuringia is the second-largest herb-growing region in Germany; the town of Kölleda was once considered the "peppermint town", where herb growers used to congregate to study herb cultivation. One-third of Thuringia is covered in forest, and is considered to be one of the best game-hunting regions in Germany. Anyone holding a valid hunting license and a local hunting permit for the area may hunt for game such as red deer, roe deer, wild boar, rabbit, duck, and mouflon (mountain sheep). Pheasant and capercaillie are protected game species that may not be hunted. The wooded areas also contain a wide variety of edible mushrooms, such as chestnut mushrooms, porcini, and chanterelles, along with wild berries, such as blueberries, cranberries, raspberries, and blackberries, which are all traditional accompaniments to game dishes. The most famous foods from Thuringia are Thuringian sausages and Thuringian dumplings. The state is also known for its sausages; steamed, scaled, and cured varieties are all prepared. Popular varieties include Thüringer Mettwurst (a spreadable cured sausage), Feldkieker (a cured, air-dried sausage dried up to eight months), Thüringer Leberwurst (a steamed pork and liver sausage), Thüringer Rotwurst (a steamed blood sausage packed in a bladder or other natural casing) and Mett (minced pork). In general the cuisine is very hearty and features many peculiarities of central Germany such as a great variety of sauces which accompany the main dish and the fashion to serve Klöße or Knödel as a side dish instead of potatoes, pasta or rice. Also much freshwater fish is used in Saxon cuisine, particularly carp and trout as is the case throughout Eastern Europe. The rich history of the region did and still does influence the cuisine. In the blossoming and growing cities of Dresden and Leipzig an extravagant style of cuisine is cherished (one may only think of the crab as an ingredient in the famous Leipziger Allerlei). 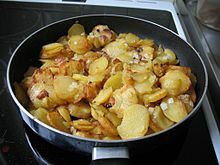 In other, impoverished regions where the people had to work hard to yield some harvest (e.g., the Erzgebirge), peasant dishes play a major role; famous dishes originating from there include potatoes with Quark, potato soup or potato with bread and linseed oil. In the Vogtland region, where the peasants were wealthier, the tradition of Sunday roast remains to this day. Cereal grain cultivation occupies 62% of the cultivated land in Saxony-Anhalt. Wheat, barley, oats, and rye are grown, with the rye being grown near Borde, where it is used to make Burger Knäckebrot, a flatbread produced there since 1931. Another 10% of the cultivated area is planted in sugar beets for conversion to sugar, popularized after the 19th century, when the region had an economic boom. The first wave of foreigners coming to Germany specifically to sell their food specialties were ice cream makers from northern Italy, who started to arrive in noticeable numbers during the late 1920s. With the post-World War II contacts with Allied occupation troops, and especially with the influx of more and more foreign workers that began during the second half of the 1950s, many foreign dishes have been adopted into German cuisine — Italian dishes, such as spaghetti and pizza, have become staples of the German diet. In 2008, there were around 9,000 pizzerias and 7,000 Italian restaurants in Germany. The pizza is Germany's favourite fast food. Turkish immigrants have introduced Turkish foods to Germany, notably döner kebab. In November 2017, it was estimated that 1,500 döner kebab shops were present in Berlin. Chinese, Vietnamese, Greek and Balkan restaurants are also widespread in Germany. Before 1990, the cuisine from Eastern Germany (1949-1990) was influenced by Russian, Polish, Bulgarian and other countries of the Communist bloc. East Germans traveled abroad to these countries on holiday, and soldiers coming to East Germany from these countries brought their dishes with them. A typical dish that came to the East German kitchen this way is Soljanka. Indian, Vietnamese, Thai, and other Asian cuisines are rapidly gaining in popularity since the early 2000s. Until the late 1990s many of the more expensive restaurants served mostly French inspired dishes for decades. Since the end of the 1990s, they have been shifting to a more refined form of German cuisine. Germany is the third largest agricultural producer in the European Union and the third largest agricultural exporter in the world. In 2013, German food exports were worth around EUR 66 billion. Several food products are internationally known brands. ^ Sevin, D.; Sevin, I. (2010). Wie geht's?. Cengage Learning. p. 81. ISBN 978-1-133-16897-3. Retrieved November 30, 2017. ^ "Michelin Guide restaurants for Germany". Retrieved 26 January 2015. ^ "German cuisine beats Italy, Spain in gourmet stars". Reuters. 28 March 2011. Retrieved 19 March 2011. ^ "Schnitzel Outcooks Spaghetti in Michelin Guide". Deutsche Welle. 15 November 2007. Retrieved 6 April 2012. ^ "Pro-Kopf-Konsum von Fleisch in Deutschland nach Art in den Jahren 2015 und 2017 (in Kilogramm)". Statista.com. Retrieved 2018-04-27. ^ New Home Economics. Forbes. 1988. p. 4. Retrieved November 30, 2017. ^ Walker, I. (2014). Germany. Major European Union Nations. Mason Crest. p. 64. ISBN 978-1-4222-9267-9. Retrieved November 30, 2017. ^ a b Hayes, Dayle; Laudan, R. (2009). Food and Nutrition/Editorial Advisers, Dayle Hayes, Rachel Laudan. Food and Nutrition. Marshall Cavendish Reference. p. 471. ISBN 978-0-7614-7822-5. Retrieved November 30, 2017. ^ OECD Review of Fisheries: Policies and Summary Statistics 2013. OECD Review of Fisheries: Policies and Summary Statistics. OECD Publishing. 2013. p. 195. ISBN 978-92-64-20344-0. Retrieved November 30, 2017. ^ GLOBEFISH Research Programme. GLOBEFISH Research Programme (in German). Food and Agriculture Organization of the United Nations, Fishery Industries Division. 1989. p. 4. Retrieved November 30, 2017. ^ MacVeigh, J. (2008). International Cuisine. Cengage Learning. p. 166. ISBN 978-1-111-79970-0. Retrieved November 30, 2017. ^ McNeill, D. (2014). New Europe: Imagined Spaces. Taylor & Francis. p. 19. ISBN 978-1-4441-1900-8. Retrieved November 30, 2017. ^ Köhler, H. (1962). Seeds in the Federal Republic of Germany. Land und Hauswirtschaftlichen Auswertungs und Informationsdienst e V (AID). p. 61. Retrieved November 30, 2017. ^ Kittler, P.G. ; Sucher, K.P. ; Nelms, M. (2011). Food and Culture. Cengage Learning. p. 173. ISBN 978-0-538-73497-4. Retrieved November 30, 2017. ^ a b Production, Consumption and Foreign Trade of Fruit and Vegetables in OECD Member Countries: Present Situation and 1970 Prospects. Pears. Production, Consumption and Foreign Trade of Fruit and Vegetables in OECD Member Countries; Present Situation and 1970 Prospects. Organisation for Economic Co-operation and Development. 1968. p. 41. Retrieved November 30, 2017. ^ Hassani, N. (2004). Spoonfuls of Germany: Culinary Delights of the German Regions in 170 Recipes. Hippocrene cookbook library. Hippocrene Books. p. 107. ISBN 978-0-7818-1057-9. Retrieved November 30, 2017. ^ Heberle, M.O. (1996). German Cooking. HPBooks. p. 77. ISBN 978-1-55788-251-6. Retrieved November 30, 2017. ^ Quick Frozen Foods (in Basque). E.W.Williams Publications. 1968. p. 48. Retrieved November 30, 2017. ^ Bach, V. (2016). The Kitchen, Food, and Cooking in Reformation Germany. Historic Kitchens. Rowman & Littlefield Publishers. p. 39. ISBN 978-1-4422-5128-1. Retrieved November 30, 2017. ^ Champlin, J.D. (1901). The Young Folks' Cyclopaedia of Common Things. H. Holt. p. 150. Retrieved November 30, 2017. ^ "Pro-Kopf-Konsum von Spargel in Deutschland in den Jahren 2005/06 bis 2015/16 (in Kilogramm)". Statista.com. Retrieved 2018-05-24. ^ Jacob, J.; Ashkenazi, M. (2014). The World Cookbook: The Greatest Recipes from Around the Globe, 2nd Edition [4 Volumes]: The Greatest Recipes from Around the Globe. ABC-CLIO. p. 498. ISBN 978-1-61069-469-8. Retrieved November 30, 2017. ^ Smalera, Paul (November 25, 2014). "Here's what Thanksgiving would look like around the world". Quartz. Retrieved November 30, 2017. ^ Taylor, K.; D, V.W.P. (2017). Etiquette and Taboos around the World: A Geographic Encyclopedia of Social and Cultural Customs. ABC-CLIO. p. 103. ISBN 978-1-4408-3821-7. Retrieved November 30, 2017. ^ Crair, Ben (July 28, 2017). "Why Are Germans So Crazy for White Asparagus?". Saveur. Retrieved November 30, 2017. ^ a b Goldstein, D.; Merkle, K.; Parasecoli, F.; Mennell, S. (2005). Culinary Cultures of Europe: Identity, Diversity and Dialogue. Council of Europe Pub. p. 186. ISBN 978-92-871-5744-7. Retrieved November 30, 2017. ^ "Bread Rolls and Coffee Are Not 'Breakfast,' Rules German Court". Food & Wine. October 3, 2017. Retrieved November 30, 2017. ^ "How to eat breakfast like a Weltmeister in Germany - Meet the Germans". DW Akademie. October 11, 2017. Retrieved November 30, 2017. ^ Lane, K. (2001). Germany - The People. History Reference Center. Crabtree Publishing Company. p. 22. ISBN 978-0-7787-9373-1. Retrieved November 30, 2017. ^ Christensen, P.; Fox, A.; Foster, W. (2012). German For Dummies, Enhanced Edition. For dummies. Wiley. p. pt154. ISBN 978-1-118-25879-8. Retrieved November 30, 2017. ^ a b Schmidt, G. (2003). German Pride: 101 Reasons to Be Proud You're German. Kensington Publishing Corporation. p. 250. ISBN 978-0-8065-2481-8. Retrieved November 30, 2017. ^ MacVeigh, J. (2008). International Cuisine. Cengage Learning. p. 167. ISBN 978-1-4180-4965-2. Retrieved November 30, 2017. ^ Sheraton, M. (2010). The German Cookbook: A Complete Guide to Mastering Authentic German Cooking. Random House Publishing Group. p. pt115. ISBN 978-0-307-75457-8. Retrieved November 30, 2017. ^ Travel, DK (2016). DK Eyewitness Travel Guide Germany. EYEWITNESS TRAVEL GUIDES. DK Publishing. p. 505. ISBN 978-1-4654-5484-3. Retrieved November 30, 2017. ^ a b Kirk, M.; Mendell, M. (2013). Live Raw Around the World: International Raw Food Recipes for Good Health and Timeless Beauty. Skyhorse Pub. p. 117. ISBN 978-1-62087-613-8. Retrieved November 30, 2017. ^ Frommer's Germany '93. Frommers. p. 26. Retrieved November 30, 2017. ^ Davidson, A. (2002). The Penguin Companion to Food. Penguin Books. p. 629. ISBN 978-0-14-200163-9. Retrieved November 30, 2017. ^ Wine Enthusiast. Wine Enthusiast. 2008. p. 36. Retrieved November 30, 2017. ^ Cave, J. (1996). Growing Your Own Herbs. The Complete Gardener Series. Time-Life Books. p. 107. ISBN 978-0-7835-4114-3. Retrieved November 30, 2017. ^ Tebben, M. (2014). Sauces: A Global History. Edible. Reaktion Books. p. 37. ISBN 978-1-78023-413-7. Retrieved November 30, 2017. ^ Moseley, J. (2006). The Mystery of Herbs and Spices: Scandalous, Romantic and Intimate Biographies of the World's Most Notorious Ingredients. Xlibris US. p. 86. ISBN 978-1-4628-0600-3. Retrieved November 30, 2017. ^ Clickner, T. (2011). A Miscellany of Garlic: From Paying Off Pyramids and Scaring Away Tigers to Inspiring Courage and Curing Hiccups, the Unusual Power Behind the World's Most Humble Vegetable. Adams Media. pp. pt48–49. ISBN 978-1-4405-3298-6. Retrieved November 30, 2017. ^ Heinzelmann, U. (2008). Food Culture in Germany. Food culture around the world. Greenwood Press. p. 94. ISBN 978-0-313-34494-7. Retrieved November 30, 2017. ^ Ensminger, M.E. ; Ensminger, A.H. (1993). Foods & Nutrition Encyclopedia, Two Volume Set. Taylor & Francis. p. 579. ISBN 978-0-8493-8980-1. Retrieved November 30, 2017. ^ Castella, K. (2010). A World of Cake: 150 Recipes for Sweet Traditions from Cultures Near and Far - Honey Cakes to Flat Cakes, Fritters to Chiffons, Meringues to Mooncakes, Tartes to Tortes, Fruit Cakes to Spice Cakes. Storey Pub. p. 97. ISBN 978-1-60342-576-6. Retrieved November 30, 2017. ^ Sachsenroeder, A. (2009). CultureShock! Berlin: A Survival Guide to Customs and Etiquette. Culture shock!. Marshall Cavendish International (Asia) Ptd Limited. p. 170. ISBN 978-981-4435-29-1. Retrieved November 30, 2017. ^ Davey, J.; GmbH, W.; Zhen, C. (2015). Wimdu City Guides: No. 1 Berlin: Berlin Travel Guide. Wimdu City Guides. Wimdu GmbH. p. 59. Retrieved November 30, 2017. ^ a b Anderson, Emma (September 6, 2016). "Learning Germany: 9 things Germans have WAY too many words for". The Local. Retrieved November 30, 2017. ^ Rector, G. (1937). Dine at Home with Rector: A Book on what Men Like, why They Like It, and how to Cook it. E.P. Dutton & Company, Incorporated. p. 112. Retrieved November 30, 2017. ^ a b Heinzelmann, U. (2008). Food Culture in Germany. Food culture around the world. Greenwood Press. p. 107. ISBN 978-0-313-34494-7. Retrieved November 30, 2017. ^ Heinzelmann, U. (2008). Food Culture in Germany. Food Culture around the World. ABC-CLIO. p. 81. ISBN 978-0-313-34495-4. Retrieved November 30, 2017. ^ Commission, European (1997). The Single Market Review: Impact on the market. Processed foodstuffs. Kogan Page. ISBN 978-0-7494-2311-7. Retrieved November 30, 2017. ^ Lubinski, C.; Fear, J.; Pérez, P.F. (2013). Family Multinationals: Entrepreneurship, Governance, and Pathways to Internationalization. Routledge International Studies in Business History. Taylor & Francis. p. 209. ISBN 978-1-135-04493-0. Retrieved November 30, 2017. ^ Kwak, Chaney (July 20, 2012). "Ice Cream Around the World: _Spaghettieis_ in Germany". Condé Nast Traveler. Retrieved November 30, 2017. ^ Levius, Travis (December 20, 2016). "10 Christmas meals around the world | CNN Travel". CNN. Retrieved 2017-11-30. ^ Nolen, J.J.; Lazor, D.; Varney, J. (2015). New German Cooking: Recipes for Classics Revisited. Chronicle Books. p. 105. ISBN 978-1-4521-3648-6. Retrieved November 30, 2017. ^ Stobart, T.; Owen, M. (1981). The cook's encyclopedia: ingredients and processes. Harper & Row. p. 87. ISBN 978-0-06-014127-1. Retrieved November 30, 2017. ^ Milling & Baking News. Sosland Pub. 1985. p. 25. Retrieved November 30, 2017. ^ Pomeranz, Y.; Shellenberger, J.A. (1971). Bread science and technology. (Avi Books). Avi Pub. Co. p. 85. ISBN 978-0-87055-104-8. Retrieved November 30, 2017. ^ a b Moeller, J.; Huth, T.; Hoecherl-Alden, G.; Berger, S.; Adolph, W. (2012). Deutsch heute. Cengage Learning. p. 138. ISBN 978-1-111-35482-4. Retrieved November 30, 2017. ^ "Let's Talk Food: Break bread, not tradition". Naples Daily News. November 29, 2017. Retrieved November 30, 2017. ^ a b League, Tariff Reform (1908). Monthly Notes on Tariff Reform. Tariff Reform League. p. 458. Retrieved November 30, 2017. ^ Jacob, H.E. ; Winston, R.C. (2016). Six Thousand Years of Bread: Its Holy and Unholy History. Hauraki Publishing. p. pt488. ISBN 978-1-78720-127-9. Retrieved November 30, 2017. ^ Food Lover's Guide to the World: Experience the Great Global Cuisines. Lonely Planet Food and Drink. Lonely Planet Publications. 2014. p. pt154. ISBN 978-1-74360-581-3. Retrieved November 30, 2017. ^ Germany. Lonely Planet Publications. 2004. p. 74. Retrieved November 30, 2017. ^ a b Weiss, L.; Pick, A. (2016). Classic German Baking. Ten Speed Press. p. 170. ISBN 978-1-60774-825-0. Retrieved November 30, 2017. ^ "Happi, Happi - Mors, Mors". Radio Hamburg (in German). November 17, 2017. Retrieved November 30, 2017. ^ Fuller, S. (2005). Fuller's Fans Guide to German Stadiums. Stuart Fuller. p. 195. ISBN 978-0-9551425-1-2. Retrieved November 30, 2017. ^ Tucker, C.M. (2017). Coffee Culture: Local Experiences, Global Connections. Routledge Series for Creative Teaching and Learning in Anthropology. Taylor & Francis. p. 65. ISBN 978-1-317-39225-5. Retrieved November 30, 2017. ^ Bekker, H. (2005). Adventure Guide Germany. Adventure Guide to Germany Series. Hunter Publishing, Incorporated. p. 28. ISBN 978-1-58843-503-3. Retrieved November 30, 2017. ^ The Black Forest (Rough Guides Snapshot Germany). Rough Guides. Rough Guides. 2015. p. pt101. ISBN 978-0-241-23481-5. Retrieved November 30, 2017. ^ "German Regional Food Specialties." Food-links.com. Accessed July 2011. ^ "Hunting in Germany". Archived from the original on 2012-05-13. Retrieved 2012-04-30. ^ a b c Nuetzenadel, A.; Trentmann, F. (2008). Food and Globalization: Consumption, Markets and Politics in the Modern World. Cultures of Consumption Series. Bloomsbury Publishing. p. 134. ISBN 978-1-84788-459-6. Retrieved November 30, 2017. ^ Light, I.H. ; Rosenstein, C.N. Race, Ethnicity, and Entrepreneurship in Urban America. Race, Ethnicity, and Entrepreneurship in Urban America. Transaction Publishers. pp. 111–112. ISBN 978-0-202-36844-3. Retrieved November 30, 2017. ^ Lentz, C. (1999). Changing Food Habits: Case Studies from Africa, South America and Europe. Food in history and culture. Harwood Academic Publishers. p. 263. ISBN 978-90-5702-564-8. Retrieved November 30, 2017. ^ a b "Food for thought: Cities where dishes from around the world come together". The Economic Times. November 30, 2017. Retrieved 2017-11-30. ^ Tan, C.B. (2013). Routledge Handbook of the Chinese Diaspora. Routledge handbooks. Taylor & Francis. p. 148. ISBN 978-1-136-23096-7. Retrieved November 30, 2017. ^ Mandel, R. (2008). Cosmopolitan Anxieties: Turkish Challenges to Citizenship and Belonging in Germany. Duke University Press. p. 94. ISBN 978-0-8223-4193-2. Retrieved November 30, 2017. ^ Fodor's Travel Publications, Inc (1998). Fodor's ... Germany. Fodor's Travel Publications. p. xxi. Retrieved November 30, 2017. ^ "Berlin's versatile Indian restaurant scene - DW Travel - 24.10.2017". DW.com. October 24, 2017. Retrieved November 30, 2017. ^ Ibp, I. (2009). Doing Business and Investing in Germany Guide Volume 1 Strategic and Practical Information. International Business Publications USA. p. 29. ISBN 978-1-4387-1049-5. Retrieved November 30, 2017. ^ Fraser, C.C. ; Hoffmann, D.O. (2006). Pop Culture Germany! : Media, Arts, and Lifestyle. Pop Culture Germany! : Media, Arts, and Lifestyle. ABC-CLIO. p. 145. ISBN 978-1-85109-733-3. Retrieved November 30, 2017. Metzger, Christine (ed.) Culinaria Germany. Cambridge: Ullmann, 2008. Sarah Kelly (1981). "Specialty Baking in Germany, Austria, and Switzerland". In Alan Davidson (ed.). National & Regional Styles of Cookery: Oxford Symposium 1981, Proceedings. Prospect Books. ISBN 978-0-907325-07-9. Ursula Heinzelmann (2014). Beyond Bratwurst. A History of Food in Germany. Reaktion Books. ISBN 9781780232720. Bach, V. (2016). The Kitchen, Food, and Cooking in Reformation Germany. Historic Kitchens. Rowman & Littlefield Publishers. p. 153. ISBN 978-1-4422-5128-1. Retrieved November 30, 2017. Hungarian or Magyar cuisine is the cuisine characteristic of the nation of Hungary and its primary ethnic group, the Magyars. Traditional Hungarian dishes are primarily based on meats, seasonal vegetables, fruits, fresh bread, dairy products and cheeses. Finnish cuisine is notable for generally combining traditional country fare and haute cuisine with contemporary continental style cooking. Fish and meat play a prominent role in traditional Finnish dishes in some parts of the country, while the dishes elsewhere have traditionally included various vegetables and mushrooms. Evacuees from Karelia contributed to foods in other parts of Finland. Polish cuisine is a style of cooking and food preparation originating in or widely popular in Poland. Polish cuisine has evolved over the centuries to become very eclectic due to Poland's history and it shares many similarities with other West Slavic countries like neighbouring Czech and Slovak. It has also been widely influenced by other Central European cuisines, namely German, Austrian and Hungarian as well as Jewish, French, Turkish and Italian culinary traditions. Polish-styled cooking in other cultures is often referred to as à la polonaise. Danish cuisine originated from the peasant population's own local produce and was enhanced by cooking techniques developed in the late 19th century and the wider availability of goods during and after the Industrial Revolution. Open sandwiches, known as smørrebrød, which in their basic form are the usual fare for lunch, can be considered a national speciality when prepared and decorated with a variety of fine ingredients. Hot meals are typically prepared with meat or fish. Substantial meat and fish dishes includes flæskesteg and kogt torsk with mustard sauce and trimmings. 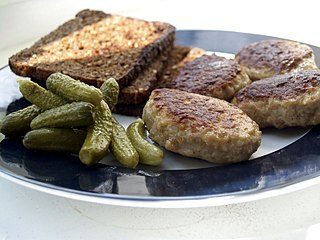 Ground meats became widespread during the industrial revolution and traditional dishes that are still popular includes frikadeller, karbonader and medisterpølse. Denmark is known for its Carlsberg and Tuborg beers and for its akvavit and bitters, but amongst the Danes themselves imported wine has gained steadily in popularity since the 1960s. Austrian cuisine is a style of cuisine native to Austria and composed of influences from Central Europe and throughout the former Austro-Hungarian Empire. Austrian cuisine is most often associated with Viennese cuisine, but there are significant regional variations. Lithuanian cuisine features products suited to the cool and moist northern climate of Lithuania: barley, potatoes, rye, beets, greens, berries, and mushrooms are locally grown, and dairy products are one of its specialties. Various ways of pickling were used to preserve food for winter. Soups are extremely popular, and are widely regarded as the key to good health. Since it shares its climate and agricultural practices with Northern Europe, Lithuanian cuisine has much in common with its Baltic neighbors and, in general, northern countries. Longlasting agricultural and foraging traditions along with variety of influences during the country's long, difficult and interesting history formed a Lithuanian cuisine. Ukrainian cuisine is the collection of the various cooking traditions of the Ukrainian people accumulated over many years. The cuisine is heavily influenced by the rich dark soil (chornozem) from which its ingredients come and often involves many components. Potato bread is a form of bread in which potato flour or potato replaces a portion of the regular wheat flour. It is cooked in a variety of ways, including baking it on a hot griddle or pan, or in an oven. It may be leavened or unleavened, and may have a variety of other ingredients baked into it. The ratio of potato to wheat flour varies significantly from recipe to recipe, with some recipes having a majority of potato, and others having a majority of wheat flour. Some recipes call for mashed potatoes, with others calling for dehydrated potato flakes. It is available as a commercial product in many countries, with similar variations in ingredients, cooking method, and other variables. Czech cuisine has both influenced and been influenced by the cuisines of surrounding countries. Many of the cakes and pastries that are popular in Central Europe originated within the Czech lands. Contemporary Czech cuisine is more meat-based than in previous periods; the current abundance of farmable meat has enriched its presence in regional cuisine. Traditionally, meat has been reserved for once-weekly consumption, typically on weekends. The body of Czech meals typically consists of two or more courses; the first course is traditionally soup, the second course is the main dish, and the third course can include supplementary courses, such as dessert or compote. In the Czech cuisine, thick soups and many kinds of sauces, both based on stewed or cooked vegetables and meats, often with cream, as well as baked meats with natural sauces (gravies), are popular dishes. Belarusian cuisine shares many similarities with cuisines of other Eastern, Central and Northeastern European countries, basing predominantly based on meat and various vegetables typical for the region. This is a list of dishes found in Polish cuisine. Street foods, ready-to-eat food or drink sold in a street or other public place, such as a market or fair, by a hawker or vendor, often from a portable stall, have variations within both regions and cultures. For example, Dorling Kindersley describes the street food of Viet Nam as being "fresh and lighter than many of the cuisines in the area" and "draw[ing] heavily on herbs, chile peppers and lime," while street food of Thailand is "fiery" and "pungent with shrimp paste... and fish sauce" with New York City's signature street food being the hot dog, although the offerings in New York also range from "spicy Middle Eastern falafel or Jamaican jerk chicken to Belgian waffles." In Hawaii, the local street food tradition of "Plate Lunch" was inspired by the bento of the Japanese who had been brought to Hawaii as plantation workers. Franconian Cuisine is an umbrella term for all dishes with a specific regional identity belonging to the region of Franconia. It is a subtype of German cuisine with many similarities to Bavarian cuisine and Swabian cuisine. It is often included in the Bavarian cuisine, since most parts of Franconia belong to Bavaria today. There are several franconian food items, which are also famous beyond the borders of Franconia, such as Nürnberger Lebkuchen, Bratwurst or the wines of Franconia. Franconia is also famous for its beer and harbours the highest density of breweries in the world.